Do you smoke? Or chew tobacco? Call 650-965-1234 for FREE oral cancer exam today. Oral cancer is the sixth most common cancer among men. In the United States, over 30,000 new cases are diagnosed annually. If it is detected early, the survival rate can be 80% or higher. Unfortunately, many oral cancer victims do not discover this malignancy in its early stages. In those cases, the cure rate is much lower. There are many forms of oral cancer. It can involved the tongue, lips, throat and other parts of the mouth. In all cases, the disease involves an abnormal growth process, which if left untreated, can result in death. Swelling, thickening or roughness on the tongue, cheek or on the floor of the mouth. White patches along the side of the tongue or on the lip. Unexplained bleeding in the mouth or throat. Soreness in the back of the mouth or in the throat. Hoarseness, chronic sore throat, or changes in the voice. Persistent sores in the lips, tongue, palate or throat. Unexplained red or white patches anywhere on the gums, tongue, throat, or lips. The number one cause of oral cancer is tobacco, both inhaled and smokeless. Patients who smoke cigarettes, cigars, pipes or other inhaled products are at increased risk. 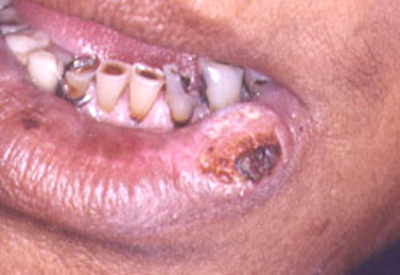 Smokeless tobacco products, such as snuff, are also very detrimental. Anyone who "puts a little bit between your cheek and gum" is making a big mistake when it comes to preserving their oral health. In order to be sure you do NOT have any form of oral cancer, you need to be examined by a dentist or physician or an annual basis. Self-examination is not enough. At a dental office, your dentist will examine your oral tissues, and can determine if you are healthy. This is especially important if you smoke. If your dentist suspects that you may have an oral malignancy, a biopsy may be ordered. This is a definitive diagnostic procedure and should always be followed if there is a suspicious area. When the diagnosis of oral cancer is made, surgical excision is the treatment of choice. Fortunately, if this is performed early, survival is often assured. Unfortunately, early detection is sometimes not made, and the survival rate is low.